If you’ve made a handmade gift, it’s especially nice to finish your pretty make with handmade wrapping paper to match. You’re sure to impress your friends with your crafting talent and it only takes a few simple products to achieve a classy finish! Add a sweet touch to your presents with this tassel adorned gift wrap. Maxine takes us step by step to show you how to achieve this fab look! 1. Take a piece of brown paper big enough to wrap your gift in. Take your Dovecraft Wooden jar stamp and repeatedly stamp it on the area that will be on display. It is up to you how many times you stamp the sheet of brown paper, Maxine has spread out her stamps to offer a varied design but if you would like a busier look, stamp away! 2. Wrap your gift with your paper, and cut a length of Dovecraft Twine. Tie it around your gift ensuring to cross it over on the front and back. 3. Take the tag die designed with a crimped edge and repeat circle design from the First Edition Tag Die set and die cut it onto Dovecraft Kraft card. 4. Add the tag to your gift by looping a small length of Dovecraft twine through the hole at the top of your die cut and attaching it to your twine. 5. To make the tassels, cut a piece of Dovecraft card approximately 6cm x 6cm. Begin to wrap your chosen Dovecraft twine around the card. 6.Decide how thick you would like your tassel to be as this will determine how much twine you will want to use. Once you’ve wrapped as much twine as you’d like, thread through a separate length of Dovecraft and tie it. 7. On the opposite side of where you made your tie, cut through the twine, ensuring to hold onto the rest of the twine securely while doing so. 8. Once cut, hold your twine together tightly and make a knot with a seperate length of twine to secure it. TIP: To add interest, thread a button through your small length of twine before tying it around your tassel. 9. Attach your tassel with Dovecraft washi tape to your gift to finish. To achieve an alternative look, we have created a few quick and easy designs that will look great for a range of occasions. 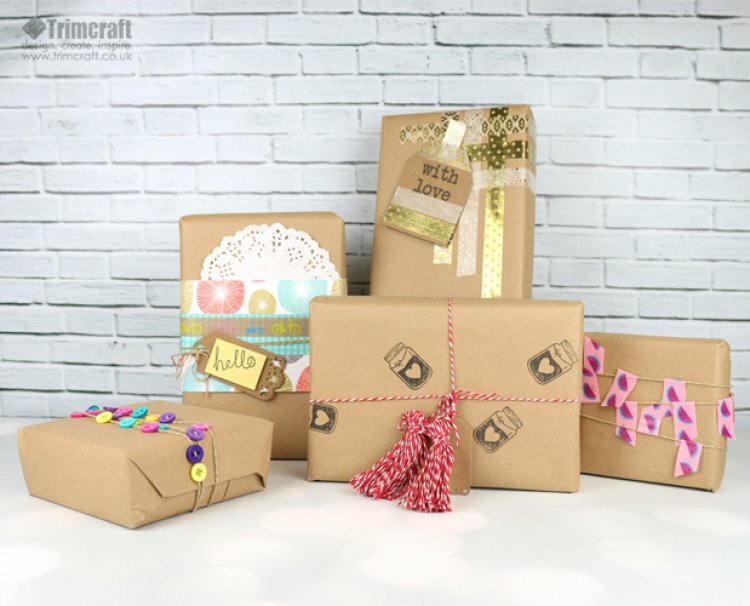 For our ‘Hello’ gift wrap, Maxine has layered a few, patterned sheets of First Edition Pick n’ Mix designs around the brown paper, securing it with a little Dovecraft Washi Tape. To add interest, she has added a paper doily and attached a First Edition die cut tag with a Dovecraft Wooden ‘Hello’ stamp sentiment. This layered gift wrap will add a spruce of colour and excite anyone opening the present! Any opportunity to use the Dovecraft Washi Tape, we will take it! Maxine has alternated her favourite washi tape designs on the brown paper to achieve a weaving pattern. She has also created a small tag and stamped it with the Dovecraft ‘With Love’ wooden stamp. To coordinate with the gift wrap, she has decorated her tag with more washi! Alternatively, for a simplistic finish you could wrap twine around your gift and cut small strips of colourful washi tape. Fold each strip around the twine and cut the edge to create a cute bunting design. Buttons are a crafters best friend and for a bright and colourful look, cut a length of twine, loop through a number of buttons through the holes to create a vibrant pattern. Add as many or few as you like and wrap your twine around your gift to finish! The gift wrapping ideas are endless; any crafting product can be used to give your gift a fabulous finish! How will you decorate your gift wrap? Make sure to keep uploading your brilliant crafts to the inspiration area and to #Trimcraft on Social media so we can see what you’re working on!